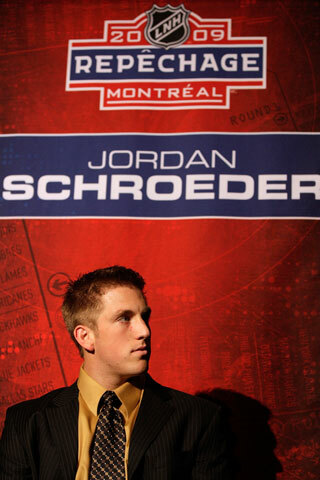 CANUCKS SELECT JORDAN SCHROEDER The Vancouver Canucks announced today that the Canucks have selected Jordan Schroeder in the first round, 22nd overall at the 2009 NHL Entry Draft in Montreal. Schroeder, 18, concluded the 2008-09 season with 45 points (13-32-35) in 35 games with the Gophers and fourth in the NCAA with a 1.3 points per game average. He was the only freshman to finish the season in the top 50 in scoring. The 5’8”, 175 pound centre was named the Western Collegiate Hockey Association’s Rookie of the Year, the College Hockey News National Rookie of the Year, the Minnesota Gophers Rookie of the Year and to the All-WCHA Second Team for efforts over the season. Ranked fifth overall in the Central Scouting's final ranking amongst North American skaters, Schroeder didn't go fifth overall but it was fortunate for the Canucks. "We had Jordan much higher rated in our selection and we didn't think he'd be available with our 22nd selection," said GM Mike Gillis. 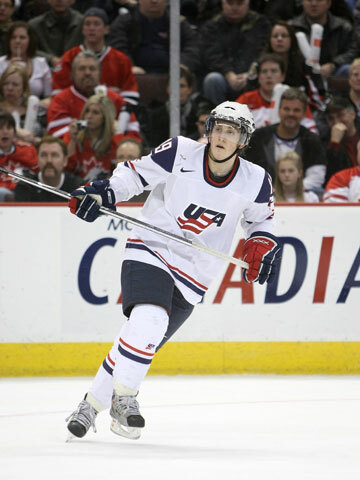 The Burnsville, Minnesota native, also appeared at the 2009 World Junior Championships as a member of Team USA. He led his team in scoring with 11 points and tied for second in the tournament with eight assists. Schroerder now holds the career record for Team USA at World Junior Championships with 15, surpassing Doug Weight (14). Prior to attending the University of Minnesota, Schroeder competed for the U.S. Under-18 National Team Development Program for two seasons, leading the team in scoring in 2007-08 with 53 points (21-31-53) in 55 games. • Schroeder, finished second on the Gophers with 45 points (13-32-45) in 35 games in 2008-09, and fourth in the NCAA with a 1.30 points per game average. He was the only freshman in the top 50 in scoring. • For his successful freshman year, he was named the Western Collegiate Hockey Association’s Rookie of the Year, the College Hockey News National Rookie of the Year, the Minnesota Gophers Rookie of the Year and to the All-WCHA Second Team. • Prior to attending the University of Minnesota, Schroeder competed for the U.S. Under-18 National Team Development Program for two seasons, leading the team in scoring in 2007-08 with 53 points (21-31-53) in 55 games. • In 2005-06 he played for St. Thomas Academy, helping the team to a 23-5-1 record and the Class A state championship with 62 points in 31 games. • At the age of four he began playing hockey in the neighborhood and his first organized hockey team was the Lakeville Mites. • He wears the number 19 because his favorite number, nine, originates from his birthday (9/29/90) and his pre-game superstition is to put the right side of his gear on first. • Falling over and cutting himself, after body checking a dummy in a forechecking drill is his most embarrassing hockey moment and if he wasn’t playing hockey he would be a pro golfer or an agent.